MADDEN RAP 2012 UNITES MEGA64 AND BRANDON DICAMILLO!! 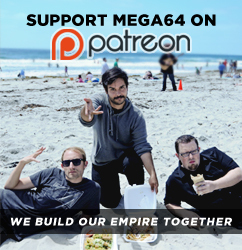 Ladies and gentleman, THE YEAR'S BEST GAME HAS RISEN, AND THE MEGA64 BOYZ HAVE RETURNED TO RAP OF IT!! We are proud to present the MADDEN RAP 2012! Watch the video here! (There's a clean version here, as well). Download the MP3 for free right here! This years' edition features a collaboration from freestyle extraordinaire/master of comedy, Brandon DiCamillo. Many of you know him from Jackass and the CKY video series. He is without a doubt one of the main comedic inspirations behind Mega64 (and our sense of humor in general), so this was one of the biggest opportunities for us, ever. Even as we post this, we cannot believe he is in our video. We hope you enjoy the track and video, and if you do, we heartily encourage you to get Brandon's "GnarKall" prank call collection. We play this entire thing on any road trip we're on, and we laugh like it's brand new every time. Come back and watch our podcast live tonight at 7PM, and we'll have more fun stuff on the way too!